We did not just fall in love with this song, it was also the whole dazzling set of so-called Aaina Mahal (mirror palace), Ranveer’s attitude, Deepika, her flawless moves and of course her mind-blowing dress. The cute and yet extravagant hat was definitely the cherry on the cake. It was designed by designer Anju Modi who also worked on the other costumes of this movie. 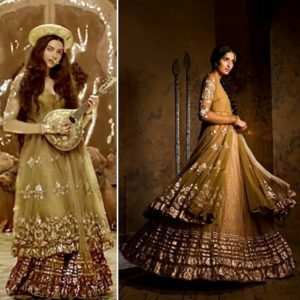 Deepika looked out of the world in this pale gold anarkali-sharara which had gold embroidered and shimmering borders. This garment would definitely be fit for her pre-wedding engagement party. 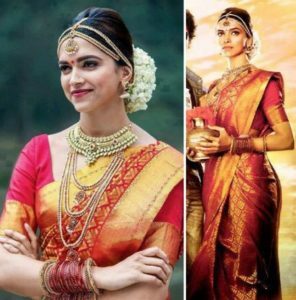 This outfit could be most appropriate for Deepika’s haldi ceremony. 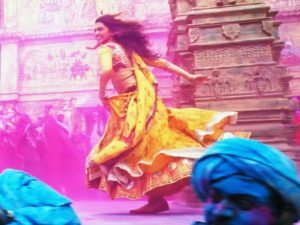 The yellow colored Ghagra choli she wore while playing the part of Gujarathi girl in Ram-Leela movie was a memorable one. The threadwork on the Ghagra and mirror work on the Choli brought out the traditional Gujarathi aspect, the designer was trying to achieve. This desi dress was given a modern touch by one of the most famous designers of the Bollywood, Manish Malhotra. He also designed all other outfits of this movie. While the yellow lehenga brought out the fun, the pink choli was oozing out with naughtiness. This kind of outfit is for fun ceremonies like Sangeet. Another outfit from Yeh Jawani Hai Deewani by Manish Malhotra, which she wore during her best friend’s wedding in the movie, would be perfect for her cocktail ceremony. 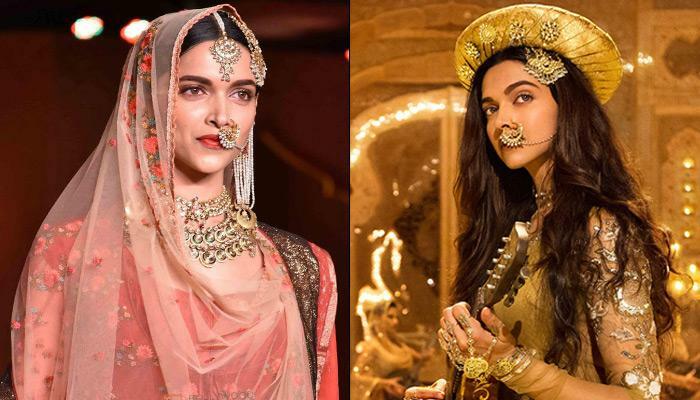 The reddish-orange lehenga choli bordered with a silver design made Deepika look too modest. This gleaming outfit which she wore for her marriage in the movie can be used for smaller ceremonies like roka in her real wedding. The pink brings out the femininity and glittering silver will definitely brighten the whole ceremony. This bright red outfit embroidered with red rose designs is simple yet feminine to the core. She looked as breathing in this anarkali as she looks in any other Indian traditional outfits. This is perfect for an event like prayer ceremony. Deepika adorned this red saree in Chennai Express during her wedding to Tangabali. Kanjeevaram or Banarasi saree doesn’t need any introduction since it’s worn by most brides during their wedding all over India. Even Anushka Sharma wore red Banarasi silk saree to her wedding reception that took place in Delhi. Deepika can drape this to her wedding which will make her look like an ultimate bride. We are eagerly waiting for this couple to tie the knot soon and until then we can only keep guessing and suggesting them in their wedding preparations.